The Beatles visited Paris for the first time in January 1964. With the distaff population of Britain - even the Queen - in their pocket, they assumed the land of Bardot would be easily conquered. Some shock, then, when the opening night crowd at the Olympia had an unusually high percentage of excitable boys. "We had visions of French girls, ooh la la and all that" sulked George. Paul to this day is convinced that most of the audience was gay. It never crossed their minds that the kids were there to see the headliner that night, France's fastest rising star - Miss Sylvie Vartan. If female pop singers were regarded as such an insignificant novelty in the sixties, it was ten times harder for female musicians to be taken seriously. Oddly this hadn't been a problem in blues circles where guitarists Memphis Minnie and Sister Rosetta Tharpe had been treated as equals. Likewise with folk, where Joan Baez, then Joni Mitchell, encouraged just as many women to pick up a guitar as Bob Dylan. But rock 'n' roll was something else. The early sixties saw the huge boom in Girl Groups, propagated by the work of Phil Spector via The Crystals, Paris Sisters, and Ronettes: three girls singing in harmony, with a cavernous drum sound and a pair of castanets, was the du jour American sound of '63 - The Shirelles, Chiffons and Shangri La's racked up scores of hits. Ultimately, there were The Supremes. The records were often written for young women by young women (Carole King, Ellie Greenwich and Cynthia Weil), but the musicians were very rarely female; 90% of these records were played and produced by men. 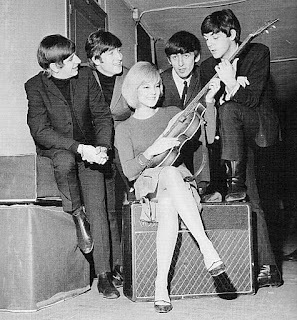 The Beatles may not have gone a bundle on Sylvie Vartan, but Stateside they caused an explosion in the number of guitars bought by teenagers, plenty of whom were girls. In Boston, the Pandoras formed because they thought being in a band was, with a neat sideways logic, the easiest way for them to get to meet The Beatles. In Los Angeles, the classically educated Sandoval Sisters swapped their violins for Fender Jaguars and Rickenbackers after seeing the Beatles on the Ed Sullivan Show, and changed their name, with devastatingly naive arrogance, to the Girls (right). Their debut single, the Mann/Weil-written Chico's Girl, is a post Shangri La's bad-boy-good-girl melodrama which ranks as one of the dozen finest 45s of the Girl Group genre - and they actually played on it. Pre-Beatles there had been a few maverick girls with guitars. Country singer Wanda Jackson was surrounded by older men telling her what to wear, what to say and what to sing until she crossed paths with hillbilly singer Elvis Presley in 1955. He convinced her that she had the voice for rock 'n' roll and Wanda duly obliged with gale-force rockers like Fujiyama Mama and Honey Bop. She painted her name on her acoustic. Off came the fringed suede jacket, too. Her new raunchy, heavy-lidded, high-heeled image went down particularly badly when she played Nashville's Grand Ole Opry where country bruiser Ernest Tubb insisted she couldn't show her shoulders. Wanda was so angry she could hardly sing. On the rhythm and blues side Bo Diddley, a paternal, philanthropic rocker, assumed correctly that most people would rather watch musicians with accentuated femininity than a bunch of paunchy blokes; to this end he tutored a string of women to play guitar alongside him. The greatest was Norma-Jean Wofford, his amazonian half-sister (at least that's what told male admirers to keep them at bay) - she was renamed the Duchess (left). For good measure, the Bo-ettes provided backing vocals for Diddley. Footage of them on pop exploitation film The TAMI Show from 1964 shows just how mesmerising they were on stage, and makes their fellow performers - the full flower of mid-sixties pop from the Stones to the Beach Boys to the Supremes - look like so much less fun. It says a lot that lead guitarist with the Beatles' Capitol label-mates the Girls, Rosemary Sandoval, was completely unaware of either the Duchess or Wanda Jackson when her own band started in '64. "We only ever came across one other all-girl band. There weren't many. In New York we met a group called The Female Beatles." The Girls' career path was typical of the period: signed by agency, plenty of local shows for reasonable money, the occasional Hollywood party, virtually no recording. "We played at a party for Bob Dylan once. Everyone was there. I remember one of the Yardbirds touched my guitar and I went 'Oh my gosh!' I was so excited." Another common fate for girls with guitars was a trip to Vietnam to give the troops a shot in the arm. "We were there four weeks" remembers Rosemary, "and our dad, who was our manager, was very protective. Afterwards he admitted we'd been in quite a bit of danger, and places we'd played got mortared." Detroit's Pleasure Seekers (right), featuring 17-year old guitarist Suzi Quatro, played the same tour with a stop-over in Guam, site of the US military hospitals. "They asked us to play for a corridor full of wounded soldiers" Suzi recalled, "and it was horrible. They were 18-year old boys... legs missing, arms missing, eyeballs missing." Gigs closer to home could be almost as bloody. The Girls, unarmed, had to deal with the mob frequently muscling in, not to mention over-amorous male fans and less than appreciative women. Rosemary Sandoval and her sisters wore "black tops, black tight pants and boots. The Midwest was not prepared for that look - too wild. We'd walk on stage in some clubs and straight away there was a certain buzz, then name-calling. And looks from some of the women, like 'what are they?' They thought we were going to steal their guys." Respect from male bands seemed to come relatively easily - The Girls played with the Byrds, Lovin' Spoonful and Young Rascals, and they were "always super-nice. They carried our amps for us! Usually they didn't think we were serious but their attitude changed when we played." If there were only a few scattered all-girl bands in the States, the UK was almost entirely barren. The Liverbirds were the only femme Merseybeat band to record, and they had to go to Germany to do it, where they became regulars on TV show Beat Club. Sally And The Alleycats grew out of the all-female Ivy Benson Big Band but cut just the one single. The Honeycombs had a girl drummer, Honey Lantree, who told reporters that she made tea for the boys. Guitar strumming heroine Twinkle had a hit with the doomed biker epic Terry, but had her career squashed by her record company Decca - they couldn't take a smart, attractive, woman guitarist who wrote her own songs. Homely Cilla and be-gowned Dusty were so much safer. 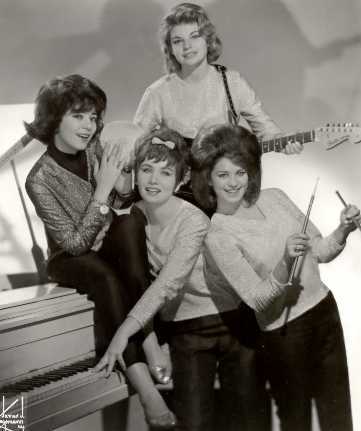 Oddly, the one girl group who did make it here in the sixties were imported Americans: Goldie And The Gingerbreads were brought to London by Animals' manager Mike Jeffries who had seen them at New York's Wagon Wheel club. It's saying something that the best known all-girl band of the era had just one Top 30 hit (Can't You Hear My Heartbeat in 1965), but they enjoyed a high profile in their two year stay. Frequent performances on Ready Steady Go, and tours with the Kinks, Stones, Yardbirds and Hollies, were augmented by drummer Ginger Bianco's ad work for Premier drums, guitarist Carol MacDonald's songwriting for Madeline Bell, and organist Margo Crocitto's session work for the Pretty Things; there were no troop-rallying chores for the Gingerbreads. Gingerbread Margo, somewhat neatly, played keyboards in the last line-up of Bo Diddley's band. The Girls, after having kids and drifting apart, got back together forty years on with the rather startling new addition of electric violins. In the wake of more recent role models - the Runaways, Dolly Mixture, Kenickie - it's now a hell of a lot easier for girl bands to be taken seriously than it was in 1966. "There weren't too many heroines in the sixties, that's for sure" sighs Rosemary Sandoval. Thanks to her and a handful of others, shoulder-baring is no longer a sackable offence. hello, Bob. Nice piece here I reckon. I fancy your writing about Lawrence too. I'm Indonesian, the country you and Saint Etienne visited 17 days ago. Alas, I was unfortune to watch you guys for one or two reasons. Do you happen to know Dara Puspita? And all-girl rock and roll 60's group from Indonesia? one more thing. Do your upcoming album do actually inspired by 'that' Lawrence? I would be very happy if you respond it. Cheers and have a nice day, Bob!